For the best family ski trip, consider going out west to Colorado, Utah, Idaho, Montana, California, Idaho, Wyoming and Oregon. Here are our Top 10 Rocky Mountain Ski Resorts selected for our ski criteria: lots of ski terrain diversity, snow abundance, ski in ski out lodging, family activities, and après ski things to do, exceptional ski and snowboard schools, plus a healthy dose of scenery and friendly locals. Of course, we have yet to ski all of the Rockies, still need to ski Washington, and New Mexico… so stay tuned for more family ski reviews. But here are our favorite family ski resorts including Best Western Ski Resorts for Early Season Snow and Best Spring Skiing in the West! 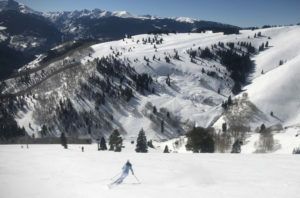 Snowmass is the largest of the four Aspen ski mountains. Skiing the Big Burn at Snowmass will make everyone in the family feel like the big cheese – or a ski movie star. With ski in ski out lodging at Snowmass Village in the posh Viceroy Hotel, and the state of the art Tree House child care center – Snowmass is ideal for families. 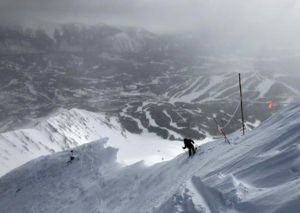 Glade expansion on Snowmass’ Burnt Mountain makes Snowmass the second largest ski resort in Colorado at 3,362-acres. Aspen’s Buttermilk is teen heaven in January when they host the trendy Winter X-Games. Siblings Aspen Highlands and Ajax in downtown Aspen are also worth a day of skiing during your family ski week in Aspen. Steamboat is a frontier cowboy town ideal for ski families. 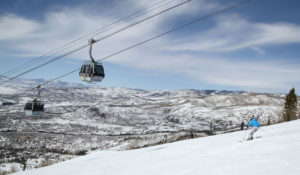 Steamboat’s ski terrain is extensive, 3,000 acres, with mostly gentle pitch and plenty of perfect aspen glades from mellow to steeper Shadows and Chutes. The Colorado snow and sun are abundant, and the on-mountain accommodations are aplenty including the Steamboat Grand. Steamboat’s Village at the mountain has everything steps away, while the downtown frontier town of Steamboat Springs, just a short drive, is authentic western and wild. Take the family to Strawberry Park Hot Springs for après ski. Also ski with Billy Kid, and race NASTAR in this Ski Town USA – home to the most US Olympic skiers and riders. They must be doing something right in Steamboat Springs. Big Sky is not so easy to get too – just one of the reasons we like it so much. 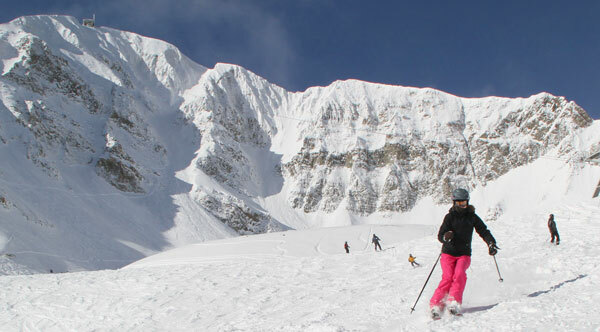 This Montana ski resort is vast, very fun and offers spectacular vistas in ski country. Now that Big Sky interconnects with Moonlight Basin, you have some of the biggest skiing in America. Staying slopeside at Big Sky’s Summit Hotel, you can walk to the lifts, to kids ski camp and to the Village Plaza with skier services, shops and restaurants. Take a day off to visit Yellowstone National Park -Old Faithful still goes off in winter, and the geysers and animals tracks are easy to spot in the snow. 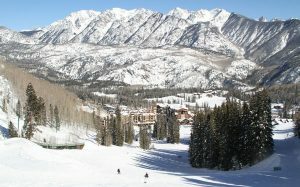 Vail is the grandfather of Rocky Mountain ski resorts (circa 1962). With so much terrain (over5,200-acres), Vail makes the top ten ski resort list easily. Golden Peak at Vail is the family ski hub, with A Small World Play School, and Vail ski and snowboard lessons just above the center of Vail Village. The best place to stay is Lodge at Vail, the original when Vail opened in 1962 long before The Four Seasons and The Sebastian. Lions Head is another village, home to swank lodging at the Ritz and Arrabelle, but we prefer the authentic Vail Village for its European ambiance to explore after a day on Vail’s Front Side or the Back Bowls. For Vail nightlife (family-style), look for the weekly free concert block parties at 6pm. On the mountain, look for Vail’s Kids Adventure Zones. Beaver Creek is like Vail – though more upscale. While not as big as Vail, this resort is posh, well-pitched and has the personal touch I like on a family ski holiday. Maybe it’s the free, fresh homemade cookies in the village for après ski, staying at the lovely Park Hyatt Beaver Creek or the centerpiece ice skating rink, or it could be the World Cup Downhill Course – Birds of Prey… Beaver Creek has something for everyone. Check out the Ritz Carlton Bachelor Gulch for a luxurious ski lunch. As family skiers, we love everything about Purgatory at Durango (accept maybe the intimidating name Purgatory). Purgatory Mountain offers plenty of terrain, fun undulating runs on the frontside, some edgier steeps and glades on the backside, and a convenient un-crowded base village with ski school, shops, restaurants and perfect condo lodging at The Purgatory Lodge with an outdoor pool and spa. As a bonus, you can visit downtown Durango to experience a real Colorado cowboy town. Deer Valley ranks as the top ski resort for service, food and grooming. I would add Deer Valley is top shelf for families – as long as there are no snowboarders in your ski group (snowboarders ban). This first class ski resort in Utah has great lifts, excellent grooming and well trained ski ambassadors to make your ski and stay at Deer Valley the best. Warning: Deer Valley real estate is hot, and happening with a new Deer Valley St Regis Hotel, and a Montage Hotel at Deer Valley, and magnificent Deer Valley ski mansions for rent. Park City is a cool après ski town, and you have more skiing (and snowboarding)at Park City now owned by Vail Resorts. Deer Valley just bought Solitude for their own Utah conglomerate. 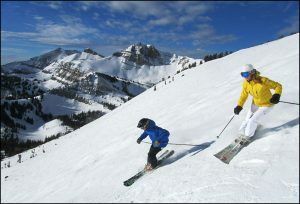 Jackson Hole is reputed for its steep and deep terrain, but this Wyoming ski resort is also a great choice for families looking to get away, see wild game in the National Parks and stay slopeside in Teton Village. The five-star Four Seasons Jackson Hole hotel is the perfect place to stay with its own kids camp, ski concierge and s’more roasting by the fire for après ski, plus a spa and sophisticated surroundings for parents. While you are in Wyoming, go to nearby Grand Targhee, very family friendly with big snow, ego pleasing terrain and ample snow at 500″ annually. When in California, Mammoth is king. Mammoth ski resort is immense, and recent upgrades including a pedestrian ski village, a gondola and some of the best terrain parks and pipes make this California ski area rock – especially for skiing teenagers, and youthful snowboarders. A week at Mammoth Mountain Resort is a treat; their kids’ camp with mascot Wooly Mammoth is a definite kid pleaser. The California sunshine on the Sierra Nevada’s, the frequent snow fall, and the super-sized ski season make Mom and Dad happy. And hey, Mammoth to Disneyland, Hollywood and LA is just 5 ½ hours away! 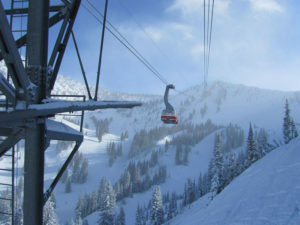 Snowbird is a favorite ski area amongst core skiers. Snowbird’s Cirque offers the country’s foremost expert terrain serviced by the tram. But for families, there’s tame terrain around the base, and slopeside hotel lodging at the Cliff House and The Iron Blossom. 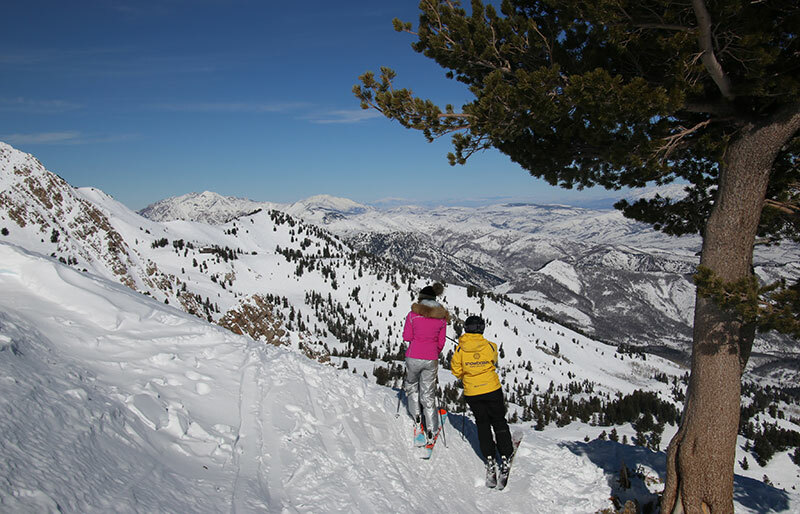 Just a half hour drive from Salt Lake City also makes this Utah family ski trip a winner as you can ski and fly the same day as East or West Coast ski travelers. A Snowbird/Alta lift ticket gains you access to two phenomenal resorts (Alta is a skiers only resort, no snowboards allowed). 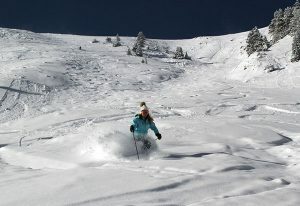 Snowbird is a top resort for spring skiing -staying open till May. This beautiful ski resort just 45 minutes from Salt Lake airport offers big mountain skiing, wide open bowls, perfectly groomed runs, three gondolas and gorgeous on mountain lodges – after all its sister resort to posh Sun Valley Idaho. 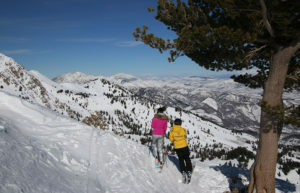 Snowbasin has the most advanced snowmaking in Utah, and some of the best views of four states too! Kids will love skiing the Olympic downhill run. Parents will appreciate the affordable off mountain lodging in Huntsville, Ogden or Eden near Powder Mountain – another hidden ski stash in Utah. The largest ski resort in Idaho, Schweitzer has tons of terrain for all abilities, 2,900 acres, and panoramic mountain and lake views. Schweitzer’s convenient mountain village has everything your family needs: ski school, condo-lodging in Selkirk and White Pine Lodge, kids activities, night skiing, après ski and dining, and the cool town of Sandpoint is just down the road on beautiful Lake Pend Oreille. Northstar is the place to ski in California if you have young children or growing kids who love terrain parks. Northstar has dialed into young skiing families. The resort village is proof, so is the all natural Burton terrain park called The Stash. A Northstar Ritz Carlton now graces the mountainside with a ski valet and spa. This Lake Tahoe ski resort is a good choice for a winter family ski trip, and you can day trip to Lake Tahoe, Squaw Valley and Heavenly.